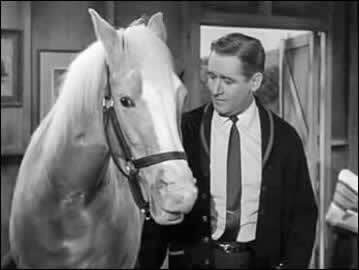 Mister Ed and Alan Young. Radio, movie and TV actor Alan Young died May 19 at the age of 96. A popular and versatile comedian, he began his entertainment career on the radio at age 13, and had his own show at 17. Changing mediums, he won a 1951 Emmy Award as “Outstanding Lead Actor” for the television version of The Alan Young Show. His best known venture into science fiction was as Filby, the Time Traveler’s loyal friend in George Pal’s The Time Machine (1960) – which he recreated in 1993 for a mini-sequel, Time Machine: The Journey Back, together with Rod Taylor as the Time Traveler. Young continued to be associated with the Wells opus, given a cameo in Simon Wells’ remake of The Time Machine (2002), and voicing the narration for 7th Voyage Productions’ animated version of The Time Machine (not yet released). 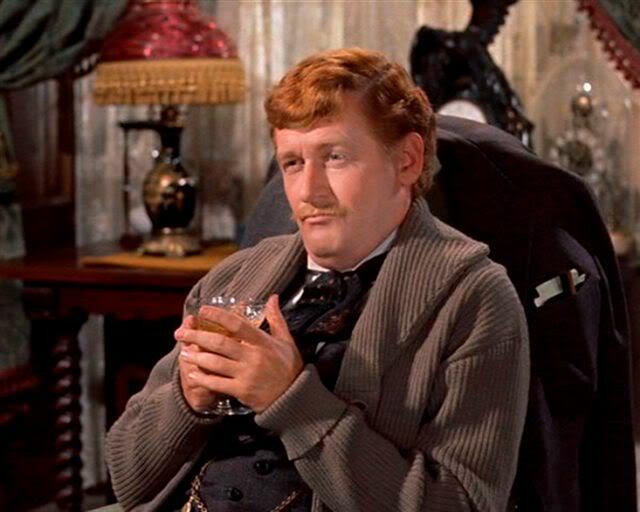 Alan Young as Filby in The Time Machine (1960). As for fantasy — he and the talking horse, of course, spent five seasons together in the TV comedy Mister Ed. Following the series’ cancellation in 1966, Young was cast as Stanley H. Beamish, the lead in the unaired pilot of a superhero series, Mr. Terrific, but another actor was given the role of when episodes were ordered by CBS. In the Seventies, Young had a supporting role in another talking animal production, the forgettable Disney movie The Cat from Outer Space (1978). After 1974 Young supplied the voice of Scrooge McDuck for many Disney videos and video games — DuckTales (1987-1990), the Kingdom Hearts series, DuckTales: Remastered in 2013, and the Mickey Mouse cartoon “Goofy’s First Love” released in 2015. 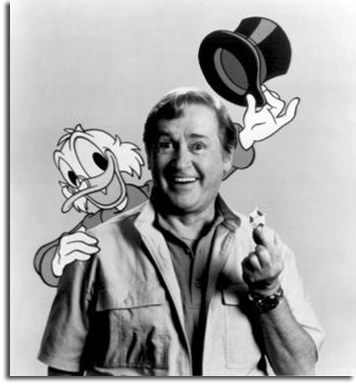 Scrooge McDuck and Alan Young. This entry was posted in In Passing and tagged Alan Young, H. G. Wells, The Time Machine by Mike Glyer. Bookmark the permalink. Mr. Filby, do you think he will ever return? One cannot choose but wonder. – You see…he has all the time in the world! Alan was a genuinely nice man, especially for Hollywood. In the last few months we have lost to other nice men, Earl Hamner and George Clayton Johnson. Always in three. OMG Scrooge McDuck! DuckTales was an important part of my afternoon for a while. That’s a shame. I liked him very much in The Time Machine. Also, at my house, Channel 9 plays what was on TV in 1961. As a result, I’ve gotten very familiar with Mr. Ed. For 1961, it’s not terrible. Mr. Ed is buried a few miles from my home, in beautiful downtown Burbank. I was lucky enough to have given Alan a Scrooge McDuck pen by Retro 51 for his birthday, a dozen years back. JKT, Mr. Ed got a famous grave? Galactic Journey: Mr. Ed is buried in the backyard of his actual owner. An equestrian property in Burbank near the Los Angeles Equestrian Center in Griffith Park. Here are some things I learned about this guy from his obituary by T. Rees Shapiro in the May 22 WASHINGTON POST. His real name was Angus Young, and he was British. He first came to fame because he was a summer replacement for Eddie Cantor’s radio show on ABC. He was a devout Christian Scientist and gave up acting for a while to build up the Christian Science media division. My mother and father were having problems coming up with a name when she was carrying me. I was told that I was going to be called Catherine if I’d been a girl (hard to come up with an original name that hasn’t been used already, when she had 13 brothers & sisters, and my dad had 4). For being a boy, they came up with David (again, unused on both sides), and somehow Alan Young was ontheir radar, because my middle name was supposed to be Alan, but when it was copied on to the birth certificate, the people wrote it down as Allen. Years later, the official spelling came up useful when I found ancestors with the last name of Allen. Over the years I’ve spelled it several ways, with various numbers of ‘L’s, and the 2nd vowel being ‘A’, ‘E’, and even a ‘Y’. I first heard the birth certificate story from my folks when Mr. Ed came on the TV. I guess mom & dad were fans of the Alan Young Show.